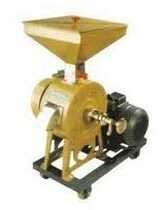 Rava Making Machine that we supply is widely used in food industry for making rava. We procure Rava Making Machine only from the reliable manufacturers and vendors after stringent checking on different industry laid standards to ensure zero defects at buyer’s end. Manufactured from high grade quality raw materials, our Rava Making Machine is accredited for its robust construction, smooth functionality and longer operational life.